Square resin bases, 40mm width. 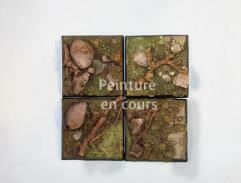 Depicting scenery leaves, gravel and branches. A fast and efficient way to give your wargaming or display models and units a great look and coherency! Suits any 25 up to 54mm miniature (Large units, heroes, etc..). 4 different models, sold unpainted.